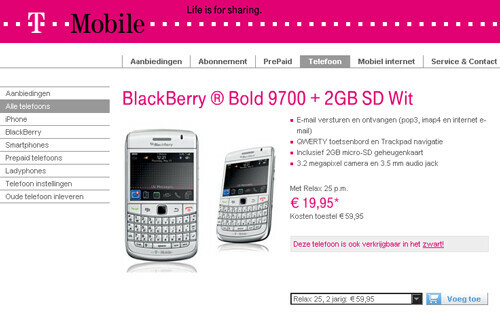 We've been hearing a lot about a BlackBerry Bold 9700 with a completely white paint job, but most recently, those rumors slowly became true as it was first seen on RIM's Thai web site. If you're in the hunt of scooping up this handset, you'll have to look towards T-Mobile Netherlands as the device is now being offered in retail stores over there. Aside from the new paint job that clearly is its most notable difference, there is nothing else new to be seen that we haven't already been witnessed to with the device already. As far as North America is concerned, it's speculated that Rogers will eventually land the device while it's up in the air as to which US carrier might opt to snag this smartphone. Surely the new color does make for some interesting glances from other BlackBerry owners who are typically glued to their handsets.